Should You Choose A New Ram Truck For Your Agriculture Business? We know that farming isn't just work, it's a lifestyle. We also know that this lifestyle requires a truck that's capable of keeping up. 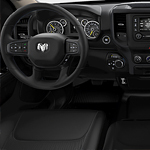 Ram trucks are built to endure the heavy-duty tasks that farming, ranching, or any other type of agriculture business provides, whether you purchase a Ram 1500, Ram 2500, or Ram 3500 variety. These trucks are designed to last, have multiple impressive capabilities and powertrain options, and offer plenty of features that make your job so much easier. We understand making the jump from your car, SUV, or truck to a minivan is a hard decision. Perhaps you're even like the couple in this video. Whether you tow gear seasonally or year-round, you’ll appreciate all that the new Ram truck lineup has to offer. Ram continues to produce trucks that perform well on most terrains and weather conditions, and here at Slingerland Chrysler Dodge Jeep Ram Fiat, we’d like to highlight some of the reasons that Ram trucks out-perform the competition during the cold-weather months. If you’ve been considering purchasing or leasing a 2018 Chrysler, Dodge, Jeep or Ram, now is the perfect time to do so. We still have plenty of 2018 models on our lot that are waiting for you to test drive including the Jeep Compass, Chrysler Pacifica, and the Dodge Challenger. We’d like to invite you to stop by and visit Slingerland Chrysler Dodge Ram Jeep FIAT to view our remaining 2018 vehicle inventory. We know you won’t be disappointed with our selection. Drivers are choosing pickup trucks more often because they can tow and haul heavy equipment. From exploring trails to towing jet skis, there’s not much the trucks can’t do. Trucks can even take on several types of terrain including snow, sand, and rock. That said, the Ram 1500 has been named the 2019 MotorTrend truck of the year for all of these amazing capabilities, plus more. This pickup has been re-engineered from the inside out for the new model year, and always signifies strength, durability, and capability. Happy June to all of our fans in the Owosso, East Lansing, Okemos, Haslett, and Flushing, MI areas! It's almost the official start of summer, and we're all about the summer trips, the BBQs, the flip flops and memories that will be made, many of which can be enjoyed in the comfort of a new Jeep vehicle. Whether you went out for brunch or stayed in with the family, we hope every mom had a great Mother's Day last weekend. Chrysler thinks the same and recently surprised some lucky mothers with a chauffeured day off. Meghan is taking care of three young kids and works six days a week. One of her children is currently undergoing chemo, so it's safe to say that she has been one busy lady. Let's see how she relaxed on this special surprise day. We have been counting down the days until the new face of our Chrysler lineup joins us here in Corunna, Michigan, and thankfully the time is steadily nearing. It's been 100 years since the first Dodge model touched down on American roads. It's safe to say that the Chrysler brand has certainly gained a ton of wisdom over the past century. The proof is in the pudding with this week's reveal of the new 2015 Dodge Challenger during the New York International Auto Show. The 2015 Jeep Renegade made its world premiere in front of a packed audience at the recent Geneva Motor Show.